As hobbies go, different people like different things. Adrenaline lovers praise dangerous and thrilling diversions such as rock climbing, skydiving and parkour, while those others who prefer calmer and a bit safer things wholeheartedly recommend occupations such as gardening, knitting and hiking. However, there’s one particular pastime which unites all those things and adds a fair amount of skill, patience and luck in the mixture and that’s an ancient and noble art of fishing. Now, the fishing can be the most relaxing and leisure pursuit in the world, as you’re basking in the sun, sipping your favorite brew and gazing at the tranquil water. However, the moment that something bites your lure and you feel the weight pull at the end of your line, this relaxation turns in the most adrenaline-infused thing in the world. And, if you have the luck to fight with a record-breaking fish, a true watery monster such as blue marlin, then you’ll have a time of your life. As the experienced fisherman would say, nothing quite beats the feeling when you’re fighting the record fish, and emerge victoriously. Fishing Clash: Catching Fish Game by Ten Square Games is a certainly one of the best fishing simulations for Android and iOS smartphones (as well as on the other platforms), a title that perfectly conveys this particular feeling, which was confirmed by its global success and more than 5 million of satisfied users. 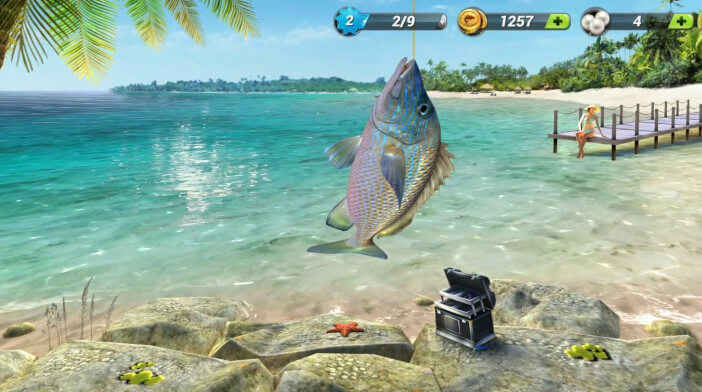 The game success to combine all the wonderful and thrilling complexities of both casual and record-breaking fishing (in different spectacular real-life locations and with the authentic fish species, beautifully rendered with colorful 3D graphics) with a simple and intuitive gameplay. However, whether you just want to pass the time with the fishing rod in hand, or you aspire to become a professional fisherman who’s aiming to catch a monster fish, you’ll have to pay attention to a quite a number of things and close-kept secrets of the fishing trade. Luckily, we have a few catches under our belt, both in the real life and in the virtual world, so we’re prepared to share with you some essential tips and tricks which will turn you in the pro angler in the no time. Without further ado, prepare for the fishing master class! This sounds like the most general and certainly the vaguest advice you can ever receive, however, it’s nowhere more applicable than when it comes to fishing. In the context Fishing Clash: Catching Fish Game this phrase means quite a few things. First of all, it’s rather obvious that the more you’ll play the more knack for the particular fishing game mechanics you’ll develop. It takes some time and practice to become efficient enough to pull the fish with the optimal tension and land it successfully on the shore. There’s a sweet spot between the two low and to high tension of the fishing line, so in order to receive the most points with every single catch, you’ll have to constantly remain in this “zone”, thus making into the 100% combo. Again, to become this good, you’ll have to play at least for some time. Then, although the size of the fish you’ll catch depends on several factors such as the level of your fishing rod, lure and boosts you’ve applied, there’s also one factor omnipresent in the real-life and virtual fishing alike – sheer luck. However, if you want to get lucky and land that record fish, as well to unlock and collect all possible types of fish that a particular venue offers, you’ll have to try and try again. In other words, in Fishing Clash: Catching Fish persistence truly pays off. There’s also one more reason why you should be persistent in this game, and on a daily basis too: a nifty cash bonus. The first 50 fishes you’ll catch will earn you a money bonus, and this opportunity will reset itself the next day, so in order to truly utilize this opportunity, you’ll have to play the game every day. What bricks and straw have to do with fishing? Well…everything, if you didn’t know. Of course, not in the literal, but in the metaphorical sense. As in any other hobby or trade, in fishing, the success of your attempts largely depends on the quality of your lures and equipment. We already mentioned that the size of your catch depends on the level of your lure and fishing rod, as well as the rarity of the particular species. That means that you have to take this into consideration and upgrade them whenever you can in order to ensure your efficiency. Lures can be upgraded by gaining the required amount of points or via the shop (this is the pay to win the game, after all). When it comes to rod upgrades, the main currency for this are pearls. That means that you shouldn’t waste them on other things, but keep them only for the rod upgrades. You can earn the pearls in a variety of slower and quicker ways. The most pedestrian way will be to complete different challenges and achievements. However, if that’s too dull and tedious for your taste, you can always go to the in-game store and buy yourself a handful of those precious shiny pearls. The more you upgrade your rod, the more different bonuses it’ll get. However, take notice that all those bonuses will be unlocked only after you’ve acquired yourself a proper pro rod. How to get one? Hold your horses, you’ll learn all about it in our next tip. Now, what’s the difference between the regular and the pro rod? Simply, a basic rod can have only up to five bonuses, while pro rod allows ten of them, which will provide you with a tremendous advantage. 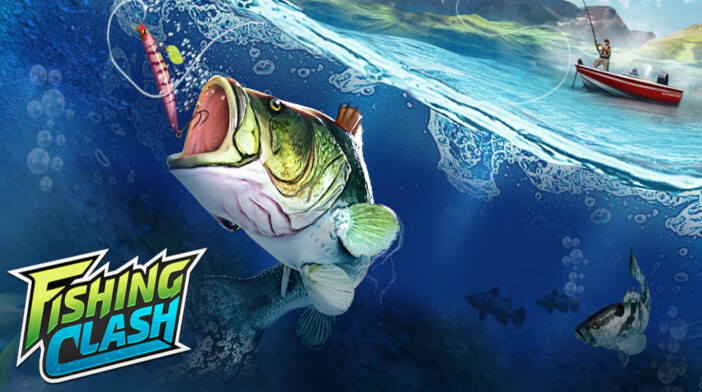 There are currently 14 different fishing locations or fisheries in the Fishing Clash: Catching Fish Game, and each time you unlock the new one, you’ll start with a basic rod. You can’t take your super upgraded rod from the previous fisheries into the new one, which is admittedly extremely annoying. However, there’s an easy and relatively affordable way to acquire it almost instantly. After you’ve moved into the new fishery, you’ll have the special offer to buy the pro rod which will last only 24 hours. Be sure to take it immediately, not only because the rods acquired this way are relatively cheap (for the first two fisheries they are under 5 bucks, and for all subsequent, they are $9.99), but because this package also comes with no less than 350 pearls. However, if you’ve missed this offer, don’t fret too much – it’s not the end of the world and you’ll probably get similar offer a few days later, or, at the very least, you’ll be able to get the pro rod if you engage in some of the daily championships that take place in a particular fishery. In the chance that you’ve missed all those opportunities, you’ll be forced to buy pro rod using your hard-earned pearls. However, this course isn’t recommended, because that you’ll probably lack pearls for rod upgrades and other necessities. Well, that’s true. Single player is the nice thing enough, but if you want to experience the ultimate thrill and earn yourself great gifts, you should try your hand against other keen anglers. To do that, just click 1vs1 button, and you’ll soon find out how good a fisherman you really are. Just take notice that, in order to be eligible to partake in 1vs1 duels against other players, you have to be at least level 3. Of course, in addition to the satisfaction that you’ve beaten your rival, you’ll also get the chance to win a bunch of nifty prizes. How this all works? It’s simple really, all you got to do is to catch the bigger fish than your opponent with two randomly selected lures to make sure that everything is balanced and fair. If you win, you’ll be awarded Hook Coins, but the specific amount will depend on your results. A simple win will get you one Hook Coin. Win with one fish that’s bigger than your rival’s attempt, and you’ll earn two Hook Coins. If you manage to win convincingly with two bigger fishes, you’ll be awarded three Hook Coins. Collect ten of those, and you’ll be able to open a so-called hook pack which will get you some free cards. Finally, this is another way which can provide you with some edge. Each species of fish comes in three types – complete all three and you’ll get yourself a randomly chosen booster item. Every little bit helps, right? Now, for most real-life anglers, fishing is the lifetime occupation. 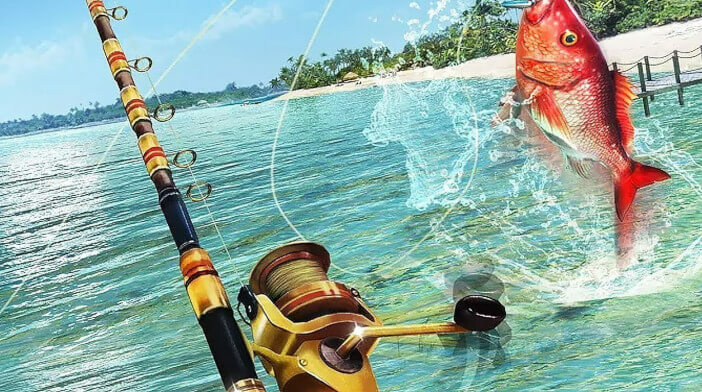 Although Fishing Clash: Catching Fish Game isn’t that engaging, it’s still extremely addictive and will provide you with many enjoyable hours. This was our choice of most useful advice for this great fishing game. 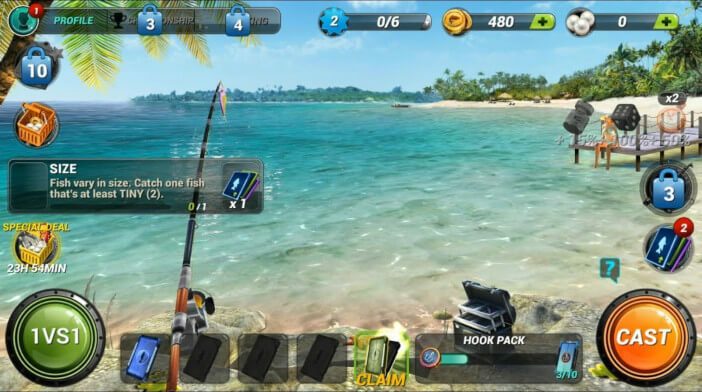 However, this game still holds many interesting contents which you’ll doubtlessly have an easier time discovering with the aid of our pro angling tips and tricks.